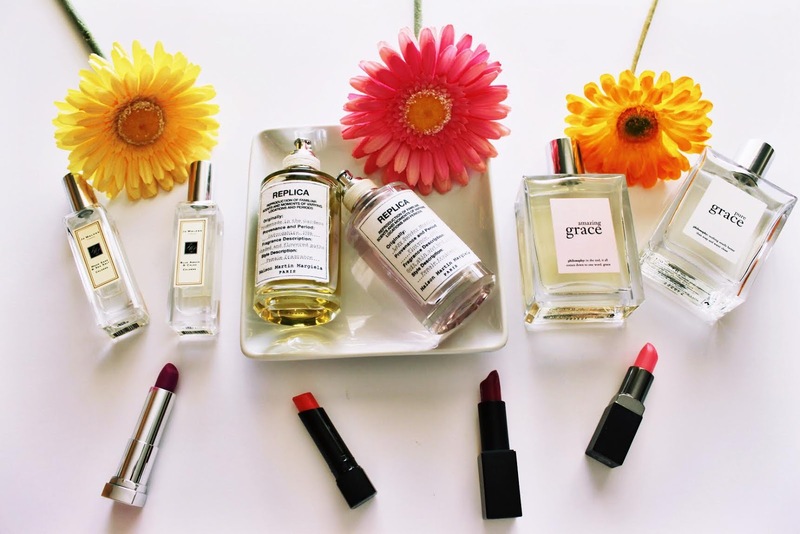 Putting on a fragrance has always been an important part of my daily beauty routine. I know for some people, wearing a fragrance is reserved more for special occasions, but I think I’ve just inherited my mom’s obsession! As much as I love fragrance, I do always make sure that I’m not putting on too much. It’s not pleasant to smell someone who has overdone it especially early in the morning. 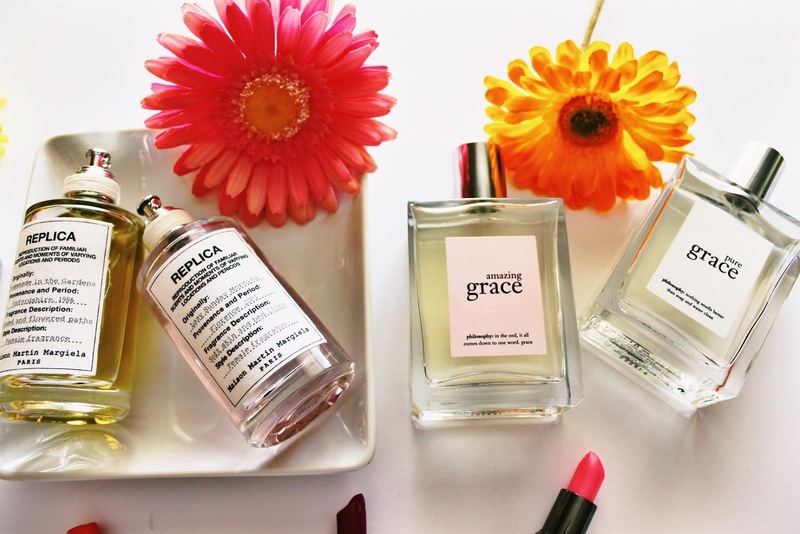 I wanted to round up a few of my current fragrance favorites as I will probably be wearing these throughout the spring season. I thought it would be fun to show two different fragrances from three of my favorite fragrance brands because the best things come in pairs! Each scent is really unique and special, which make me really look forward to wearing them every day no matter my mood. You know how music can bring you back to a certain time in your life or remind you of a day, event or experience? For me, certain scents are like time machines in that they evoke strong emotions or memories of a certain time or place. When I first graduated college and began my first job, I used to wear Balenciaga Florabotanica all of the time and now every time I smell it, I immediately transport back to that time. In a few years time, I know the below will remind me of this time in my life and everything that I’ve got going on. And that’s really what I love most about wearing fragrances all year around. Jo Malone Wood Sage & Sea Salt: I love the freshness of this scent, which is almost reminiscent of the feeling you get when surrounded by nature whether you’re near a big lake, waterfall or woods. It has an earthiness to it, yet it’s completely feminine and perfect for every day wear. Jo Malone Blue Agava & Cacao: This scent immediately drew me in because I’ve never smelled anything quite like it. It falls into the floral category and definitely has hints of sweetness. There’s something enticing about it, which is why I’d say it’s perfect for a night out when you’re feeling a bit sexier or edgier than usual. Maison Martin Margiela ‘REPLICA’ Lazy Sunday Morning: I thought the name of this scent was absolutely perfect when I first got it because it’s definitely a relaxing, weekend fragrance. Its scent contains the perfect notes of lily, patchouli, iris and white musk. Lazy Sunday Morning is a true summer scent and although it’s light, the fragrance lingers quite nicely throughout the day. 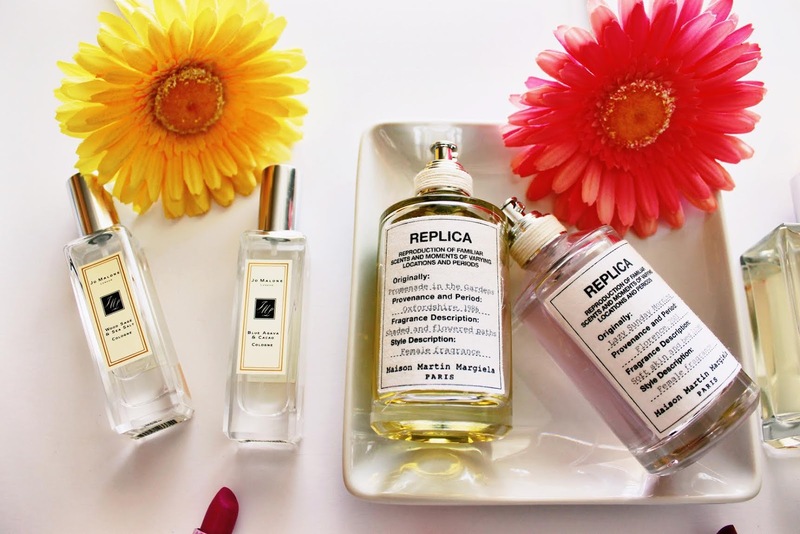 Maison Martin Margiela ‘REPLICA’ Promenade in the Gardens: If you love romantic floral scents, this one will make you swoon. I get so many compliments when I wear it because it’s quite powerful in a good way. The scent is essentially what you would smell if you were to get lost in an English garden surrounded by rows of flowerbeds. Promenade in the Gardens has hints of Turkish rose, patchouli, sandalwood and vetiver. Philsophy Pure Grace: I smelled this scent on someone a few years back and knew I had to have it right away. It is probably the definition of a clean, fresh fragrance. I love how invigorating it is, almost like having a shower! It’s a great every day scent and will make you feel instantly refreshed. Philosophy Amazing Grace: Like its sister, Amazing Grace is incredibly clean and fresh. It’s a perfectly feminine scent with notes of bergamot, muguet blossoms and musk. There’s really nothing not to like about it!